Starting this weekend, you can take your bike on select MARC trains running between Baltimore and D.C. on the Penn Line. 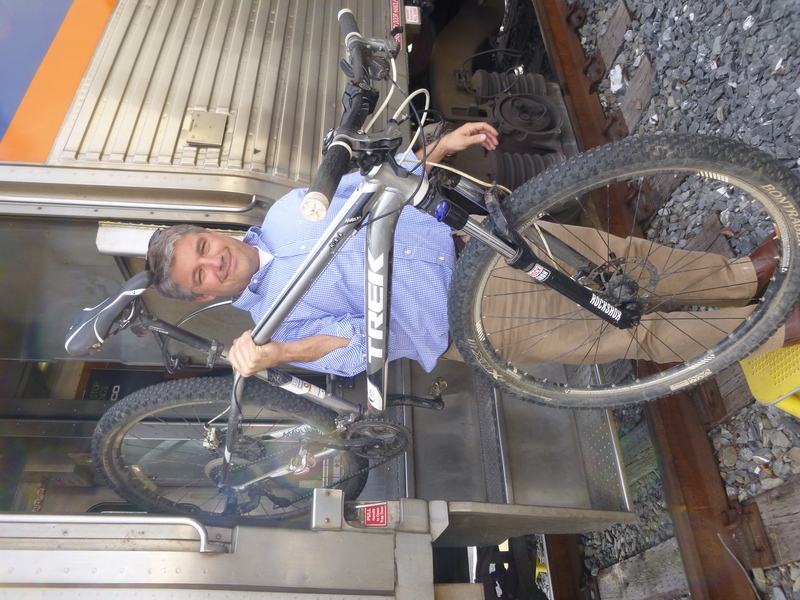 MARC outfitted two rehabilitated passenger cars to carry passengers and their full-size bicycles. The bike cars will run on weekends between D.C. and Baltimore, for now. Bike cars will be easy to spot: they’ll have bike themed graphics on the outside of the train, including “THE BIKE CAR” in big letters. The train car provides roll-on / roll-off service: there is no need to box up or fold your bike. At some train stations the platforms are level which makes rolling your bike on fairly easy. At non-level stations, you will need to be able to carry your bike and personal belongings up the stairs to load your bike. No reservations are available—it’s first come, first served. If the bike car is full, folding bikes are still allowed per MARC’s current policy. Bike trailers are not allowed. With additional state resources, MARC is purchasing new double-decker train cars to increase passenger capacity to meet the demand. With new cars going into service, MARC is rehabilitating their old rolling stock to provide the new bike service. The bike cars can currently carry 16 full-size bicycle, but can be modified to accommodate up to 26 bikes. The first two bike train cars are pilot designs. Launching weekend service allows MARC officials to evaluate the design and operation of the service with lighter passenger traffic. With a refined train car design and operation kinks worked out, MARC will look to expand bike service to weekdays and other lines. Depending on customer demand, MARC might add a second bike car to service in 2015 (read: go use the service!). There is no definite timeline for expansion to weekday service at this point. You can view the schedule here (pdf link). A great big thank you to MARC for expanding service to passengers with their bikes. We would especially like to recognize Chief Mechancial Officer Eric Ekolig and his team for thoughtfully engaging with bicycling community. We look forward to a successful roll out of weekend bike service and future expansion. Topics: Uncategorized. Tags: advocacy, Baltimore, bikes on trains, MARC, Maryland.